Frances first started popping up on my Yelp searches a little over a year ago. With 4.5 stars, it immediately grabbed my attention. And then I tried to make a reservation. When I discovered it was booked solid for 2 months, I knew I needed to try this place. I did make one around Thanksgiving, but after what I now refer to as the Delfina incident, I was worried my mom wouldn't like it so I cancelled. I couldn't have been more wrong. If you don't like Frances, something is seriously wrong with you. It's small, but not cramped. It has a bright, welcoming feel, almost like you've stepped into a friend's home. Based on the size, I understand why they book up so fast. (Well, that, and the Michelin star, James Beard nominations and several publications naming it one of the best new restaurants in the country in 2010 thanks to Executive Chef Melissa Perello). As my birthday gift to my friend Devon, I offered to treat her to dinner. Although the restaurant does book up far in advance, they reserve the bar and counter seats for walk-ins. (Much like Flour + Water). We arrived around 5:15 and had no problem grabbing seats at the bar. (In fact, there were several seats during most of our stay here on a Thursday night...though the reserved tables were packed). Every day, they offer a "market shot." On the menu, they explain it as: "whatever we find at the market gets juiced, spiced and spiked." I love this idea! On this particular evening, it was tangelo, Almanac Winter Wit, and Meyer Lemon. It was refreshing and a perfect way to start the meal. One of the other cool things about this place is they have their own red and white house wines that the beverage director blends using grapes from Miraflores Winery. What does this mean? It means they can offer a good quality wine at an ultra affordable price. They charge just one dollar per ounce. ONE DOLLAR. You pay for only what you drink, which is determined by the lines on the carafe they sit in front of you. We drank the whole carafe, which was only $18. A steal! Since Devon can't have gluten, it limited some of the things we could try, but we still managed to find lots of tasty treats on the menu. From the "bouche" section, we ordered these Baked Cherrystone Clams served with winter greens, fennel and bacon cream. I thought it tasted like mini bowls of clam chowder...a perfect savory bite. And even though Devon couldn't partake, I just had to check our Frances' famous applewood smoked bacon beignets. Oh. My. God. Fried dough and bacon? Yes please. I liked that the bacon wasn't overpowering and the dough wasn't too heavy. The best part about this dish is they come with a maple chive crème fraîche. WOW. I could've eaten this with a spoon, but I refrained. I'd also like to try the chickpea fritters at some point, which also receive rave reviews. Next up was the appetizer section of the menu. 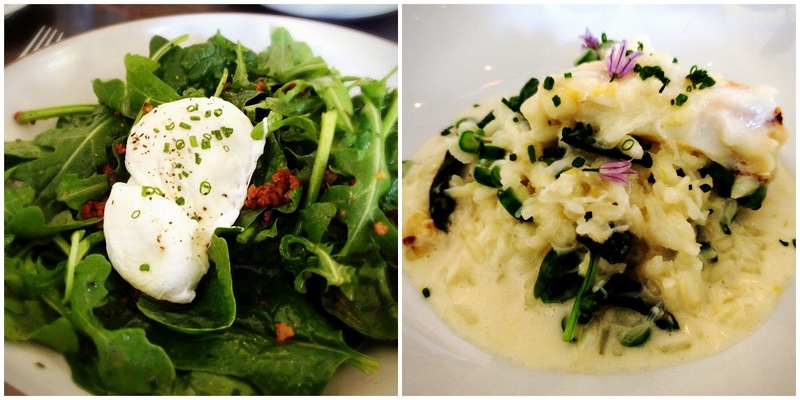 We ordered the warm spinach salad with a poached egg, bacon vinaigrette and crispy shallots (which we got on the side). Just like so much of the food here, it was simple yet so fresh and flavorful. In Devon's words: "I could take a bath in this vinaigrette." Similar to our visit to Gary Danko, we also couldn't pass up the seafood risotto. This one was a Dungeness crab risotto with Delta asparagus and Meyer lemon crème. Despite being a risotto, it wasn't heavy in the least. The crab, asparagus and citrus made for a bright spring dish. We cleaned both plates, even though our waiter, Christian, tried to take away the risotto before we could enjoy the last tiny bite. Devon inadvertently yelled at the guy, and we spent the rest of the meal giggling and apologizing about it. We split an entree, which was a California halibut, served with smoked potatoes, grilled asparagus, crème fraîche and watercress. Two things I will remember about this dish: the potatoes were unreal. Simple but so flavorful and perfectly cooked. And speaking of perfectly cooking things, I'm going on record to say this is the best cooked fish I've ever eaten. If a fish could be juicy, this one was. It was flakey and soft and melts in your mouth. And as if we didn't have enough food already, we also ordered a side of roasted cauliflower with Castelvetrano olives, lemon and ricotta salata. Sides can so easily be forgotten, unless they are done exceptionally well, which this one was. I would have never thought to add olives to cauliflower, but it was a lovely pairing, and I might just have to attempt recreating this dish at home. And because it's not a birthday party without a candle and dessert, we got two! Our awesome waiter Christian even sent out some extra cookies and a candle. Most of the desserts were off limits because of the gluten, including the famous "Lumberjack Cake," but we were perfectly content with what we ordered. We got a scoop of salted caramel ice cream with burnt caramel sauce they poured over it right before we dove in and nearly had a spoon fight trying to finish it. 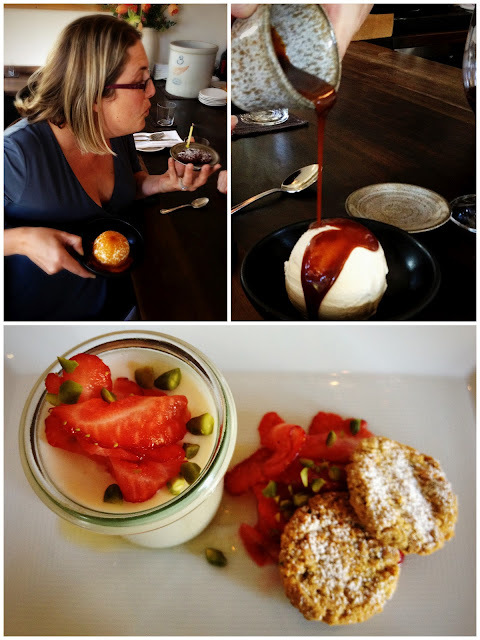 We also got the honey & buttermilk panna cotta with strawberries, pistachio sables (made with almond flour), and honey. It was a great contrast to the rich caramel ice cream we had just devoured. Extremely light and a perfect finish to a perfect meal. This place has definitely shot up near the top of my list of favorite spots in the city. Not only is the food amazing, fresh, and extremely high quality, but it's also pretty reasonably priced. (Unless you order the whole menu like we did). I love the affordable house wine and the simplistic approach to making really, really good food. 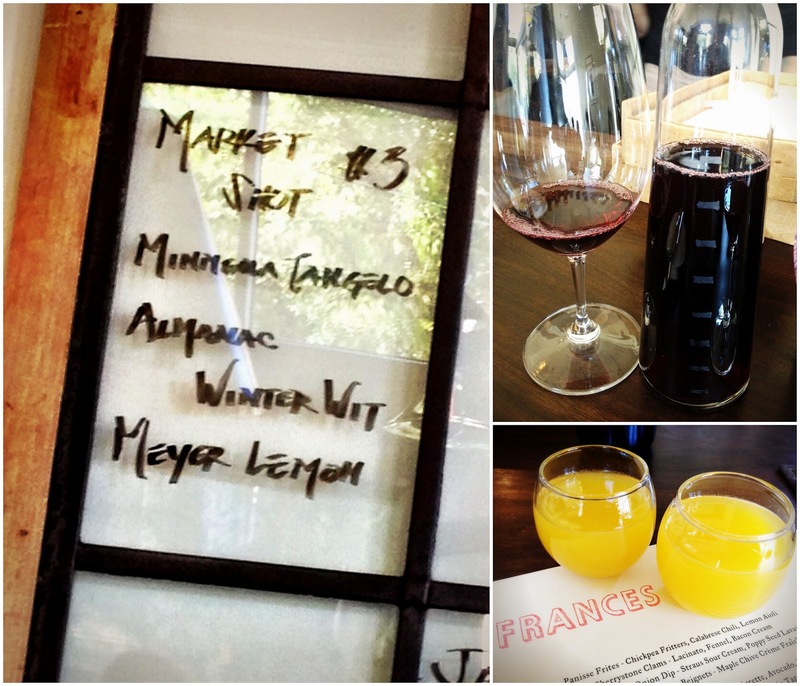 Dined at Frances last year and loved the food. Chef Melissa also signed the menu as a take home souvenir. Gotta go back for that Lumberjack cake! Btw, why is it called that? Thought you may know the background story.